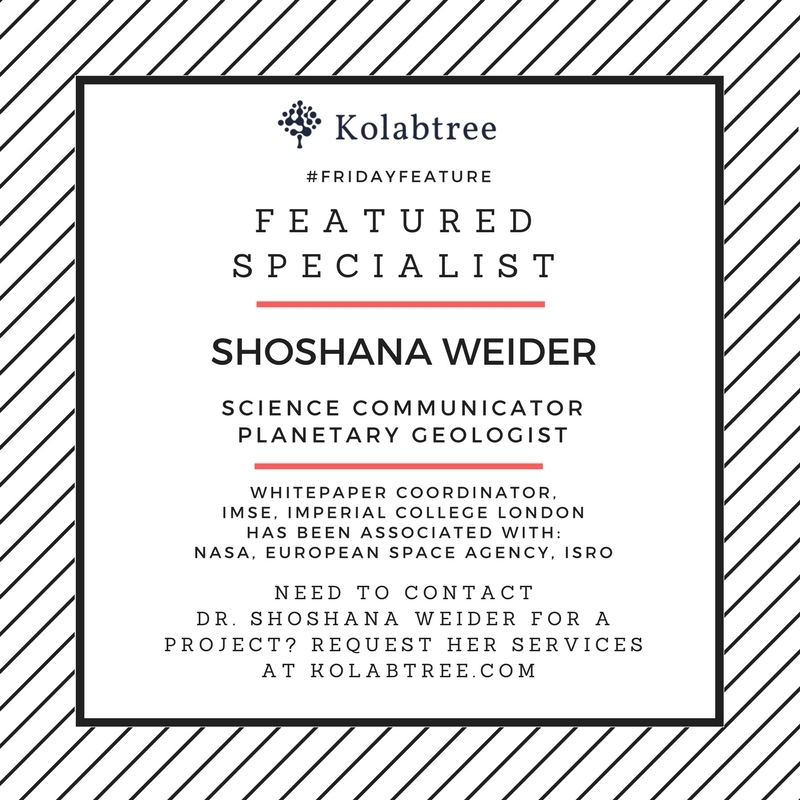 Dr. Shoshana Weider is a PhD-educated planetary geologist with several years of postdoctoral research experience. She is currently White Paper Coordinator, Institute of Institute of Molecular Sciences and Engineering, Imperial College London. She has a professional science communicator, with extensive experience of scientific copyediting and writing. Having worked with some of the world’s leading organizations, she has honed her unique ability to assimilate complicated information from a variety of sources and convey its meaning to a variety of audiences. She has worked at the forefront of solar system exploration, and has been involved with the scientific, engineering, and communication aspects of several missions led by NASA, the European Space Agency, and the Indian Space Research Organisation. She has more than 20 peer-reviewed publications in a number of top-tier journals, and is an experienced reviewer of papers and grant proposals. She is also a keen advocate for STEM-based education and pubic outreach projects, and has a variety of experience communicating science subjects to the UK and US media. Dr. Shoshana Weider is an alumnus of the University of Oxford, Birkbeck College and the Carnegie Institute of Washington. Want to get in touch with her for a project? Request her services on www.kolabtree.com.